What is it About Joint Replacements, My Dentist and Antibiotics? Knee and hip joint replacements have proven to be some of the safest and most popular procedures, even among men and women as younger than 60. Then, why do so many of the patients need to take antibiotics, such as amoxicillin, before they see their dentist? The answer, in short: patient safety and infection prevention. Yet, as with many medical issues, the full answer is not that simple. The phrase “antibiotic prophylaxis” simply means taking the medication as a preventive measure. 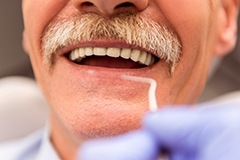 When the dentist works on your teeth, bacteria from the mouth can enter the bloodstream. In most people, their body’s immune system kills these bacteria. People with health conditions — such as some cardiac problems, heart valves, pacemakers and replacement knee and hip joints – may have trouble fighting the infection. If a joint becomes infected, treatment can take a long time, even requiring replacement (called revision surgery). Some people experience allergic reactions, upset stomach, even nausea from antibiotics. Be sure to tell your Orthopedic Surgeon or Dentist if you’ve experienced this in the past. Taking antibiotics too often can result in your body’s bacteria developing a resistance to the medication. In 2009, the American Academy of Orthopaedic Surgeons recommended consideration of antibiotics for all total joint replacement patients before a dental visit. In 2015, the American Dental Association issued a practice guideline recommending AGAINST prophylactic antibiotics to prevent prosthetic joint infection. What type of dental procedure is planned. Simple cleaning? Or more invasive fillings, root canals or other dental work? Are you experiencing canker sores, cold sores, tooth abscesses, herpes or other mouth infections? Can you tolerate the antibiotics? Talk with your Orthopedic Surgeon about their recommendations. They are more likely to recommend pre-dentist antibiotics if you suffer from diabetes, rheumatoid arthritis, cancer or are being treated with certain chemotherapy medications. Above all – enjoy life more with your new hip or knee Joint. Do You Need a Knee or Hip Joint Replacement? Take our Quiz. Find an Orthopedic Specialist near you.